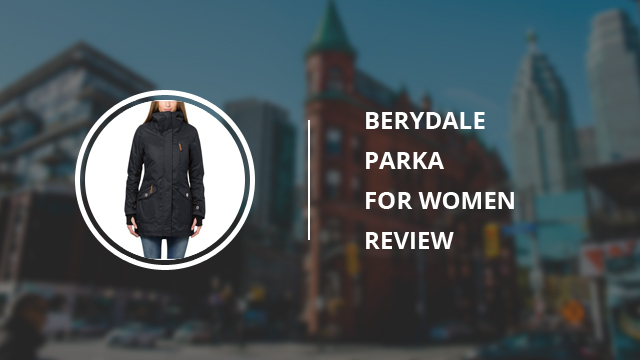 Ladies’ turn this time and we will be reviewing an elegant parka, by a first-time brand in our review articles, Berydale. This brand’s designs are intended for both comfort and style, because, after all, despite the season, looking good is just as important as feeling good. Because this jacket is a parka, when it comes to seasons, it is certainly intended for winter. The design is casual, which makes it easy to match and combine with different outfits and clothes, be it either pants or dresses. It is medium-length, going lower than the hips, which is a good length not only because, let’s face it, looks really good and carefree, but also because of functionality. It is easier to move around in than if it would be with a longer jacket, and it covers the back, offering some more protection against the weather. The main zipper, apart from being waterproof, is also covered by a snap-button placket, but is a 2-way zipper, making it much more comfortable when sitting down, for example, without having to take off the whole jacket, or zip it all the way down. The stand-up collar is chin-height and has an attached hood to it, which has a fake fur seam around, removable by zipper. The seam does not stand out and isn’t oversized, like in most parkas, but it is subtle, just to add some more protection during cold drafts. 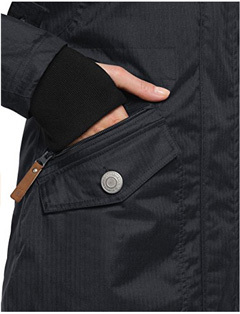 Another feature are the thumbholes in the inner cuffs that protect the hands, without having to always have gloves on. The outer cuffs are standard, with decorative snap button flaps around. Pockets are another thing that catch the eye right away, specifically the two oversized side pockets. They have flap closure, but the right one has a zipper over it as well, opening to an extra pocket. There is a chest pocket and mesh inner pockets, which make it easy to carry everything you need with you, while leaving room for the hands as well. Around the waist there are drawstrings, which adjust the fit of the jacket and at the same time highlighting the body shape. This parka makes a great daily jacket and is suitable for those who enjoy going on walks, too. The material is 100% Polyester for the outer shell, while the inner lining is made of synthetic fibers. It has a water column of 5000mm, making it waterproof, which combined with the high breathability, makes this jacket to easily face unpredictable weather. Despite not being visible from the outside, the inside is quilted, which helps distribute the padding adequately and adds to its ability to provide warmth, and also helps in insulating the jacket. And since we mentioned insulation, the high collar, the cuffs and material itself, ensure that there will be neither dampness, nor coldness getting through. The faux fur seam on the hood is high quality and soft and because it is removable, it can be worn appropriately and as preferred. As we mentioned previously, the style of the jacket is casual, making it quite easy to combine it with different outfits. This is also aided by the color selection, which features beautiful, muted colors that go great with many outfits. The colors in which this jacket comes are four and they include the classic Black and Grey colors, as well as the colors Navy and Brown. These colors are quite neutral, as far as jacket colors go, and not only do they combine easily and beautifully, but they are also quite classy colors, adding a touch of elegance to the look. Considering how many reviewers, and happy ones too, have left their impressions and experiences for this parka, we will try and summarize them as best possible. Looking at the parka, it does appear to be quite lightweight, which might concern some of you when it comes to whether it is appropriate for low temperatures, but indeed it is. Many reviewers have worn this jacket throughout winter and are happy to report that it stays warm and cozy at all times. And as for its waterproof ability, it does remain dry as well. 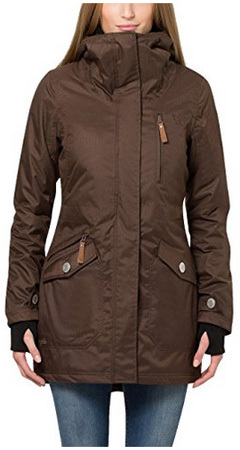 Seeing as how some reviewers live in windy areas, they comment on how the parka is certainly windproof and fares nicely against cold winter drafts. The comfort of wearing it is undeniable. Despite being a nicely padded parka, it is neither bulky, nor heavy, making it all the more comfortable to move around and also wear for long hours. The quality and design are the most appreciated and mentioned things about this jacket. It looks elegant, well-made and the fit is as if you’d had it tailored. Because the colors are not as shiny as they appear in the photos, they go great with the elegant style of the design. This parka has everything a high quality winter jacket should have. It has a classy casual design, with beautiful colors, which combined with the quality of the material certainly seal the deal. Whether you live in areas where winter is harsh and dry, or rainy and cool, rest assured that this jacket will adapt easily and remain warm and dry, no matter what. So take a look at Berydale’s women’s parka, because it might just be what you were looking for.